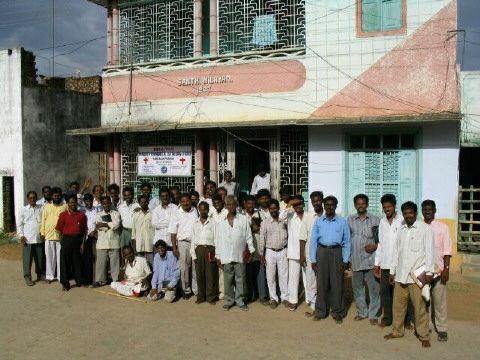 One of our sister church bodies in India, the Berea Evangelical Lutheran Church (BELC), operates a full-time, 2-year pastoral training course in the city of Nagalpuram. On February 20, 2009, the first graduating class of 16 men received their diplomas, and will soon be assigned to congregations. Missionary David Koenig describes the happy occasion below, for which we thank the LORD. We just finished the graduation at Nagalapuram and returned to Chennai. That is the way to spend the day. The 16 were graduated, exept Suresh was absent to take an examination for his teaching, and Chellaiah was absent due to a child being ill. We gathered on the roof of the building we rent for classes with an awning overhead to protect from the sun. It was a beautiful day with a fine breeze blowing to keep us cool, fluffy clouds going across the azure blue above. Four of us spoke: Pastors Rajamani, Sampath, Ude and me. Three men had prayers interspersed. Pastor D. Paul read the responsibilities to the men and they answered they would carry them out. As the men knelt for blessing, seven of us proceeded individually to each man to pronounce a blessing with prayer laying on hands to each. I was granted the privilege of handing out the diplomas. At the close student Edwin Raj spoke thanking each for the teaching and help, including the CLC USA. Pastor Aseervadam closed the program with a more casual talk. Afterwards we ate a meal cooked up by D. Paul’s wife. The devil certainly took one on the chin today as these men went forth to serve the living Lord.